I think the worst thing about running on a cold winter day is thinking about the cold. But once you get going and warmed up a bit it's not so bad and you can think about other things. I met with Karla, Jenn and Lisa in Cary at 5am for the drive down to Winston-Salem and we made good time and were able to snag the best parking space in the lot, directly across from the port-a -potties and 50 ft from the starting line. 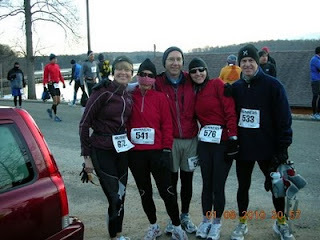 With the temperature at about 17F there was very little socializing before the race and we spent most of the time sitting in the car staying warm while we prepared to run. With 5 minutes to go we finally headed over to the start and the beginning of the days journey. My plan was to go out for the PR attempt but I knew I needed to hold back a little until I got warmed up and not push it too much the first half of the race. So at the sound of Don Besse's bugle we headed out onto the trail. I was running along very comfortably sticking to the plan at just under 10 minute pace until the hill at 1.3 miles in and after reaching the top I gradually picked up the pace. By the time I reached the 1st aid station around the 3.6 mile mark I was ahead of pace and feeling great. I just grabbed a cup of water which I poured half down my chest and was quickly on my way. The next 3 miles I knew I was going a little too fast but I was having a hard time slowing down. Quickly into the 6.5 mile aid station, I just grabbed some gatorade, spoke to friend Charles West who was crewing and helping out and then I began the next section on the paved greenway. This is a good place to make time but it is also a pretty section ,especially where a creek goes through a rock cut between bluffs with the railroad up on the hill. When I got to the 1st turnaround, I was just a little over a minute ahead of pace averaging about 8:50 ( shooting for 9:00) so I made a real effort to back off the pace on the return trip. Three minutes after making the turn I saw the ladies, Lisa, Jenn and Karla and I stopped just a few seconds to snap a picture and took off again. Back at the aid station I grabbed a couple of chocolate chip cookies and ate them as I walked up the short, steep hill from below the dam back up to the lakeside and then took off running again. The next several miles were uneventful as I settled in and relaxed. I was maintaining a very even pace, feeling good and enjoying the day. It was nice to see many friends on the out and back course and to offer and receive encouragement. I had several people tell me that I looked strong and relaxed but looked like a man on a mission. Normally I do a lot of talking but not when I'm racing for PR's ! I reached the halfway point exactly on pace in 2:20:10 and was quickly on my way out again. The race was really just beginning now and a lot can happen in the second half of an ultra, but I knew if I could just stay relaxed and stick to the plan I should be able to hold it together. A little less than 5 minutes out I saw the ladies once again still smiling and looking great. But I knew they were still too fast and told them to slow down as I snapped another photo. My split to the next aid station was exactly the same as the last time through and dead on 9 minute pace. A quick gel and gatorade and out I went. The next 3 miles I began to slow slightly but was maintaining the same effort. I reached the final turnaround about 2 minutes behind 9 minute pace but still ahead of pr pace. I felt a surge of energy and excitement and ran the 1.25 miles back to the next aid station in 8:40 pace and then walked up the dam hill again. Just as I crested the top I saw Karla and Jenn. I could tell they had finally slowed down but they looked great. Of course being the beautiful ladies they are they always look GREAT ! I was sad to hear that Lisa had taken a fall and had decided to call it a day after about 20 miles. At this point it looked like I had the pr in the bag as long as I didn't fall apart so I backed off the pace a little again just trying to stay comfortable until I reached the last aid station. Including the walk up the hill I averaged 9:39 pace to the last aid station where I took one last gel. All I had to do now to guarantee the pr was maintain at least 10 minute pace the last 3.6 miles. I hit the split on my garmin and over the next several miles I was very happy to see that I was not only well below the 10 minute pace but was actually speeding up a little. I finally came to the last hill and knew when I reached the top I had less than 1.5 miles to go and so I started to push the pace knowing I didn't have to worry about bonking now. And it was amazing. Although a much slower pace, I was pushing the effort like I was finishing up a 10k and as I crossed the line I had set the new pr by 2:47 in a time of 4:44:11. Lisa was there to greet me and then we waited for Karla and Jenn to finish. I was eagerly watching the clock and hoping to see them come out of the woods in good shape and sure enough they finished strong and smiling. It was Jenn's 2nd best ever and Karla improved from her Derby debut by 3 minutes. I am very happy and proud to have come back so far in the past year to be able to set a 50k pr at age 54. It was also amazing because I did not do any Chi running or any Pose Method. I have not done any Cross-fit classes or leg weights. And most amazing of all I actually wore shoes !!!! So how did I do it? The old fashioned way. I ran a lot and trained hard and smart. And most of all I have to thank God for giving me the strength and health to do what I love and for wonderful friends and family to support me. Here are some pictures that Alan Wiggs took with Ben Dillons camera on the course. And here are the few I took. I didn't want to stop and take many since I was trying to run fast. I only paused for 2:30 seconds the entire race at the aid stations, to snap the two photos of the ladies and to pee one time so I obviously wasn't lolly-gagging around or wasting time . Congrats! And keep it up!